Last thursday I let a friend of mine introduce me to one of her favorite activities, a sport I had never tried before: Rock Climbing. The first thing you should know about rock climbing is probably that it looks much easier than it actually is. The goal is to reach the top of the wall (roughly 15 meter high) by only using single color markers. Naturally, different colors indicate different levels of difficulty, then the inclination of the wall comes into play, straight walls being the easiest. There is no glory for those who don't make it to the top. 'Almost made it' does not count, pick an easier track and try again. Halfway to the top, you will be tempted to look down. A strange contradiction will take place in that moment: A part of you, the stubborn part, will tell you "You're almost there, look how far you've come". The rest of you will be scared shitless. I hope for your sake that in that moment, your stubborn self will speak the loudest. When your idea of a sport is to be hanging by a rope while attempting to climb a wall, choose wisely who it is you want it to be holding the other end of that rope. A possibly spiteful ex is NOT a good idea. 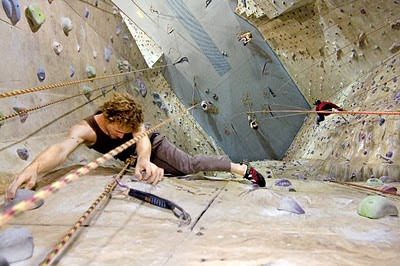 The great thing about climbing is that it can have very little to do with muscle strength. It can teach you how to use muscles you never rely on, and you'd find yourself amazingly balanced in a hilariously weird position. The moment you touch the last marker and you're all the way at the top, you will look down again, and a part of you will still be scared shitless. But even that part won't want you to come back down. When you're almost at the top, and it seems you've run out of your own color markers, you'll be the only one who really knows whether or not you're cheating. It's only when it's time to shower and change that you will discover how many bruises and scratches you really accumulated. Do not kid yourself, you will try to bite off more than you can chew, and you will fail.The key is to keep trying. You might not get the desired result the first few times, but quitting is not an option unless you'd rather settle for disappointment. Well that's it for my rock climbing experience. Hopefully I'll do it again (and again, and again) soon, but in the meantime, find yourself some walls to climb, and think about all those times you let fear stop you halfway to the top.